The woman, who was allegedly beaten up at the Bijanbari police station where she had taken shelter on Sunday, has given wrong information regarding her family and whereabouts, the police said today. She had been admitted to the hospital with bruises on her thighs and hands. The woman in her mid-thirties had said she was from West Sikkim and had a daughter and a son. She had also said she had come to Bijanbari in search of a job. 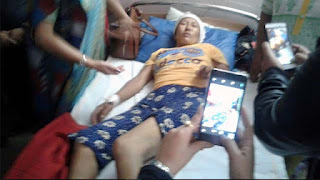 Darjeeling police chief Amit P. Javalgi said: "The person she had described as her father and a gram panchayat member of the area from where she said she was visited the lady at the hospital yesterday. Neither of them could identify her." He added: "The headmaster of the school in which the lady had said her son was studying could not verify if such a student was enrolled." The SP said the woman was not kept at the police station on Sunday night. "The lady was not kept at the Bijanbari police station for the night. The officer in charge of the police station got a call around 3.45pm (on Sunday) from some people in Bijanbari who told him that a lady, who was not in her senses, had lost her way. She was not from the locality and the caller asked if the police could take her to the police station." He added: "The OC (officer in charge of the police station) asked if she was a minor or an adult and on being informed that she was an adult, a team consisting of a male ASI, lady constables, lady home guards and lady civic police were sent (to get her). On the way to the police station the lady became violent. She was brought to the police station so that her address could be traced and she could be handed over to her family."